Set to debut in Moscow in August. BMW gave birth to the coupe-crossover segment when it unveiled the X6 back in 2008, and its style-over-substance approach was lapped up by people around the world. Global sales of more than 250,000 units equates to an annual average of over 40,000 throughout its six years. BMW hopes the second-gen model will continue to pay dividends in the lucrative market niche. Comprehensively re-engineered alongside the third-gen X5, the X6 MkII retains its predecessor's familiar silhouette, but is more structured, with bolder styling and bigger proportions. It also boasts improved aerodynamics and more extensive standard equipment, including bi-xenon headlights (the full LED treatment is optional), 19-inch alloys (optional 20s), and an automatic tailgate. Despite higher equipment levels, the new X6 is 10 kg lighter than the outgoing model at 2,065 kg in its lightest xDrive30d form. Two trims are available – the low-key xLine and the luxurious M Sport, which adds typically aggressive M-branded add-ons, including an aerodynamic body kit, larger air intakes, and matte aluminum grille, as well as an Adaptive M suspension, self-leveling rear air suspension, and upgraded interior. Inside, the latest X6 shares much with the X5 such as a restyled dashboard, sports steering wheel, more heavily contoured seats wrapped in Dakota leather, an iDrive infotainment system with a 10.25-inch display, and elegant trims such as Poplar Grain, Brushed Aluminum and American Oak. The rear bench folds in a 40/20/40 arrangement, and the X6 can hold up to 58.3 cubic feet of cargo. Three different engines will be available at launch: sDrive35i, xDrive35i and xDrive50i. The first two models are powered by a 3.0-liter turbocharged inline-six rated at 300 hp and 300 lb-ft of torque, the sDrive using rear-wheel drive, the xDrive all-wheel drive. The xDrive50i crowns the lineup with a 4.4-liter turbo V8, generating 443 hp and 480 lb-ft, an increase of 42 hp and 37 lb-ft over its predecessor. 0-62 mph comes in 4.8 seconds, a 0.6 sec improvement. All models come mated to an eight-speed automatic, which BMW claims are more efficient than before. 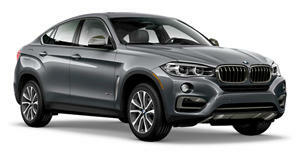 Outside the US, the X6 will launch with a pair of diesel engines. The 2015 BMW X6 will hit US showrooms this fall.